← Our Writing is Getting Better! I blame my ignorance about learning of the event on last May’s tornado, which continues to hold a grip on me. I blame my stumbling upon the event to nothing less than divine intervention. Last Sunday, I happened into our public library to complete an overdue critique group assignment, where I discovered that the very next day, my favorist author among all my favorite authors, Jane Yolen, was coming to my little town. How could I have missed knowing about such an influential writer speaking just a few miles from my house! Sunday was crazy-busy for me, but on Just-hanging-out-Monday, I felt like I was getting ready for a prom date. That night, I’d see Jane Yolen in person! There was that nervous stomach thing going on, a tightness in my throat, the turning upside-down of my library trying to find and then decide which books authored by Jane I should take along, the wondering why the day seemed seven times longer than usual. Does she like blue? Maybe I should wear red instead? I arrived at the building as soon as the doors were opened, expecting to find a line going down the street to the entrance. The parking lot was empty. There wasn’t a line. My heart sunk. Had the event been cancelled? Or maybe something happened that Jane couldn’t make it? (I found out laster, she had transportation and food difficulties.) Perhaps people hadn’t arrived because of the 82 degree summer-like weather, or because of the parent-teacher conferences going on. Whatever the reason, besides the book sellers, I was the first to arrive. I bought a couple of her new books, then wandered into the empty auditorium. I still felt stunned wondering where everyone was. I knew my teacher-friend who normally attends author visits with me <wave to Becky> couldn’t come at the last moment (conferences). I headed towards the front. I looked up to see Jane Yolen — THE Jane Yolen — gliding alone across the dark stage from the book-signing table to the podium. I felt both bold and at the same time like a small mouse. This was/is Jane Yolen, but, after all, we are friends on FaceBook. I may have leaped right up there, or I may have taken the side steps, but within seconds I was shaking hands with Jane, praying I wouldn’t purst into tears and that I’d be able to remember my own name. Eventually, about two hundred people came. Jane has written more than 300 books for children and teens, and a collection of poems after her husband died. Monday evening, she signed books both before and after her talk, personally inscribing each. I lingered nearby for the before-talk signing, hoping some of her authorship and experience would gently blow over me. She made eye-contact with each person as they handed her a book. She engaged them in conversation, asking questions. Most impressive to me was that if an elementary school aged child handed her a YA book to sign, Jane held the book in her hand, looked directly at the child, and after ascertaining her age, told her or him that the book was written for older kids, not really for her/his age group. She then turned and addressed the parent and made sure they understood, adding. “I’ll sign this now, but I don’t want you to read it for a couple of years, all right?” Of course, the child verbally agreed. Personaly, I would have wrapped the book in satin and kept it under my pillow until my 12th birthday. She explained how she was first going to read some picture books, and then, before she read some of her YAs, she would not feel insulted if younger kids and their parents got up and left. However, there were only a handful of teens, and many younger children. I’m thinking she adapted the talk on the fly, depending on the audience. She integrated her writing life and personal life as she read some poems in BUG OFF and five picture books, including OWL MOON. Her words and expressions sounded like her written words, e.g., “… these insects are really icky… and wonderful.” She told the story of how nearly everyone she knew knew before she did that OWL MOON had won the Caldecott Medal, but they weren’t allowed to tell her until illustrator John Schoenherr was told. She concluded by reading SNOW IN WINTER. Both of Jane’s parents were writers — her father was a journalist, and her mother wrote short stories and crossword puzzles. So child-Jane had the impression that all adults were writers. She acknowledged there were other jobs in the world, but assumed they were all authors when they weren’t working their non-writing jobs. There were several times when I thought, I felt, I knew Jane was speaking directly to me. She told us that she’s been other things, but she’s always been a writer. Like dancers and athletes who train and exercise every day, Jane writes every day, even if it’s as simple as title options or journaling or jotting notes for another story. I’d mentioned to her before her talk, how Emily Dickenson only had eight of her poems published while she was alive. Jane ammended that by saying it was seven poems. Then, during her talk, she brought up that very thing, adding that Emily Dickenson was “a neighbor,” living two towns away (when she lived). Jane quoted one of Emily’s poems called “Tell It All,” looking at life slantwise and how writers need todo the same. Six children came to the microphone to ask Jane questions. Two of the answers I find worthy of repeating here. 1) Q: How many years or days did it take you to write a book? A: The shortest was three days; the longest was twenty years. 2) Q: How much do you like writing? A: I’m never happier than when I am writing. I was mean when I wasn’t writing. When I mentioned to her before the talk, that thrice my manuscipts have made it to acquisition groups, she assured me that I just hadn’t found the right editor, and urged me to keep trying. After the talk another teacher friend and her teenaged daughter <wave to Jodine and Marissa> and I talked about Jane for a while, and then as they went up for a book signing, I decide to have Jane sign a third book for me. When I reached her, Jane reminded me not to give up (writing), and then, as she handed me back my book and I reached for it, she didn’t let go. She looked deep into me and said, “Keep in touch.” I was certain she meant I was to let her know as soon as I get that elusive book contract. Oh, how I love my heroine, Jane Yolen. I want to be just like her when I grow up. This entry was tagged author talk, Jane Yolen. Bookmark the permalink. Great post – the ending brought tears to my eyes. Me,too, Sharon. But as you know, it’s really only the beginning. 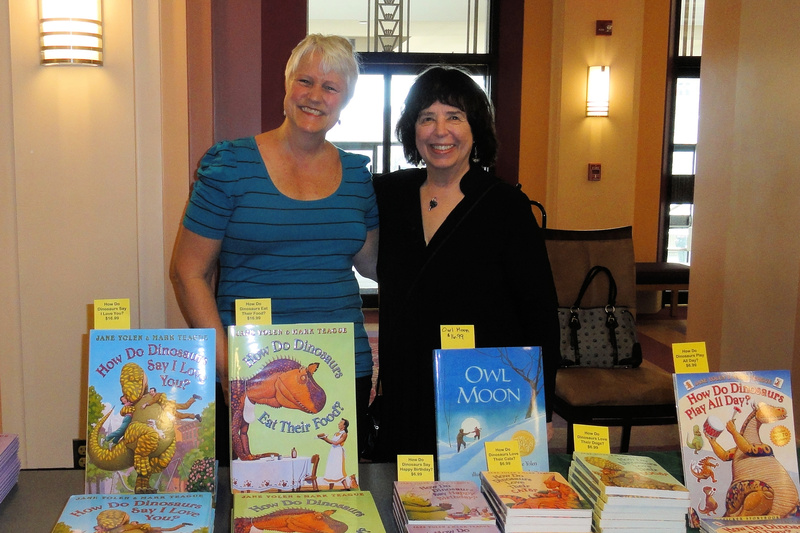 Sandy – thank you for sharing your personal experience of meeting Jane Yolen. I can hear the exuberance in your writing here. After all the rejection shots you’ve had to endure lately, and getting so close, this is just what you needed to get back on that horse and forge ahead. I agree with Jane – I’m my happiest when I’m writing. Me, too, Jaclyn. I SO related to that partof Jane’s talk, for I’m a total bear when I’m not writing — ask anyone who has to be around me during those nasty times. Snow in Summer, Sandy. And it was only the first three pages of the novel. That’s a very accurate word, Jane — “squeeeeeee.” And you’re quite welcome. How awesome. You made me feel like I was there. I went to a book signing with Kelley Armstrong last year. She was so nice to everyone in line like Jane Yolen. That really impressed me. So glad you got to go to this. Sandy Carlson writes: Humblest appologies about WordPress not letting “outsiders” comment. Here are two additional comments I’ve received. What an experience. Those positive thoughts and feelings will energize you forever. Thanks for writing about it.